In 2005, Ford took the air filter game to a new level by introducing a lifetime air filter on Ford Focus models with the 2.0L or 2.3L PZEV engines. If you are thinking this was an oiled cotton filter, you are wrong. 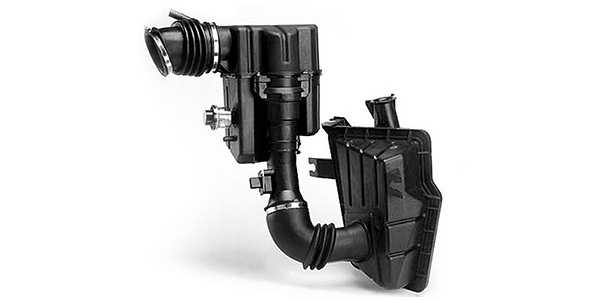 The filter was designed to last the lifetime of the vehicle and would never need service or replacement. The rumor is that for the Focus to get the PZEV rating, it had to meet specific anti-tampering and lower maintenance requirements. In the early 2000s, many of the requirements brought about larger catalytic converters and double platinum spark plugs that could go 125,000 miles before replacement. The lifetime promise could be made because the filter used traps and advanced foam filter media that increased the capacity of the filter without hurting its efficiency. The filter used different layers of foam with different levels of filtering. The larger particles could be separated from the airflow before reaching the filter media designed to stop small particles. It was a technology that was ahead of its time. But, a lifetime for one driver is not the same as a lifetime for another driver. 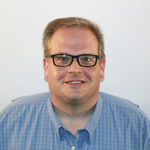 The lifetime for normal service, according to Ford, was about 150,000 miles. But, if the driver lived on a dusty road, a lifetime might be shorter. Drivers reported clogged filters in as little as 80,000 miles, while others had operational filters well past 200,000 miles. The filter was located in the driver’s side wheel well and required the removal of the fender liner and other components to access it. 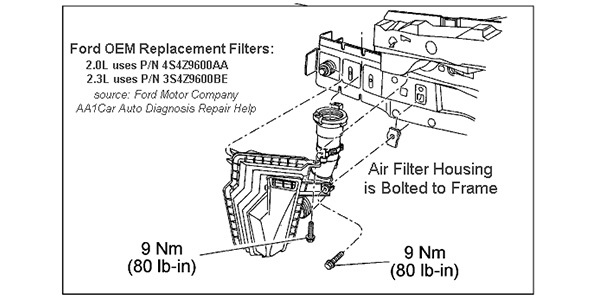 The air filter assembly includes a restriction gauge that can be seen from under the hood. The gauge is like a diesel air filter gauge with red, yellow and green indicator levels. If the filter is restricted, the assembly can cost as high as $500 and bill .3 hours of labor. But, many filters never made it to their lifetime mileage where they became restricted; often the filters were damaged in collisions or encounters with snow banks or curbs. 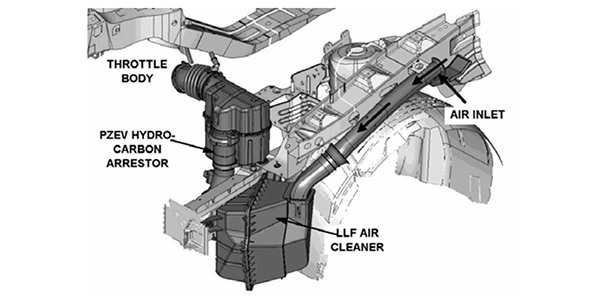 When the housing is damaged, the most common symptom is a code for a lean fuel trim because the mass airflow sensor is located on the assembly. There are solutions in the aftermarket. Companies have introduced filter housings that can accept a conventional-style panel air filter. This option can reduce the replacement cost in half.